So long, failed and bitter Kofi. HERE is Kofi’s farewell speech delivered today at a college campus in the same state where Winston Churchill gave his famous Iron Curtain Speech in March 1946. But, unlike Churchill, Kofi’s speech was bitter and misdirected. And, unlike Churchill, Kofi will go down as one of the most awful leaders in history. 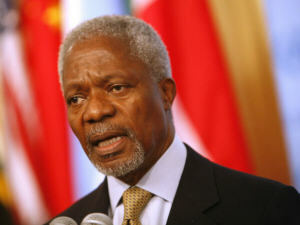 Annan presided over the largest financial fraud in history and several genocides. Annan was unwilling and unable to confront the corrupt league of dictators and Jew-hating Islamofascists who roost at the UN. But Kofi got one thing right… He chose Missouri for his farewell address rather than Rwanda or Darfur! My friends, we have achieved much since 1945, when the United Nations was established. But much remains to be done to put those five principles into practice. My friends, our challenge today is not to save Western civilization – or Eastern, for that matter. All civilization is at stake, and we can save it only if all peoples join together in the task. Surely not. More than ever today Americans, like the rest of humanity, need a functioning global system through which the world’s peoples can face global challenges together. And in order to function, the system still cries out for far-sighted American leadership, in the Truman tradition. Why do I have a feeling that this is not the last America-Bush-bashing we hear from Kofi? Maybe Kojo will pick him up in his Mercedes on his last day? STACLU has a roundup on Kofi’s address.